This is surly the best plugin for PDN ever , it's soo awesome . I think this is the turn of PDN from normal to professional ! Been wanting mesh warp for a while now and I'm so glad to finally have it! Very cool I can finally remove photoshop. This plug-in is very usefull, but I encounter some problem using it (Paint.net 3.5.10 and Win XP, italian version with SP3). Sometimes the "deformation" doesn't happen on the image after i click on OK button. After some try it seem that this behavior occurs when i change the number of row&coloumn with the number selector in the "Grid size" menu. If i change the number with the 2 "grid" button the plugin works, if i change the number/s and then use the zoom it work, if a write a new number and then make the wrap (deselecting the number in menu) it works. But if i change one or both numbers and then make the deformation, they remain selected (see the attached jpg), and when i press OK the wrap disapear (as if I had changed the grid density resetting it) and the deformation doesn't occour. It's a bug or I'm do something wrong? Yes, I know this problem too. Sometimes (mostly) the deformation doesn't work immediately, but immediatly I found the solution. What helps: Open the effekt-menu once more and "repeat grid-warp" - that makes the work becomes "reality". I try, but it doesn't work. I create 2 video to show the behavior, in the 1st I use the drop down menu with the numbers, after the deformation the number value remain highlighted and Grid Warp doesn't work (both the 1st time and the effect repeat time), in the 2nd video i use the more/less density grid button and it works. 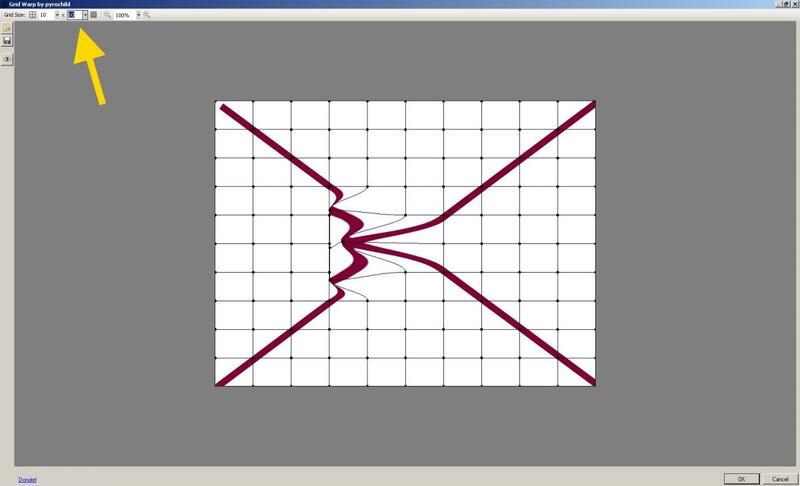 If you see the 1st video in slow motion, when i press "Ok", the deformation grid seems to reset itself before closing the Grid Warp windows. OK I see what's happening. I'll look into a fix when I have some time. This looks great and the answer to my problem. But, I have been trying to use Grid Warp and have not yet figured out how to save the image once I have modified it. It is probably very simple, but can anyone help me? I tried that, but where does it save it and under what name. Sorry if I am being really thick, but this is not intuitive. What I have done so far is to load an image, click on effects then on advanced then on scriptlab and it brings up the scriptlab menu. I have then clicked on GridWarp which brings up the grid and enables me to move things around (very effectively). I click on OK and something appears to happen but I just can't find where the revised image is saved. When I try and repeat the exercise I am also offered the opportunity to 'repeat ScriptLab' but if I click on that, the line across the bottom of the screen moves, but nothing else happens - what is supposed to happen? What exactly is 'MyScript'. Again, I apologise for asking these questions, but I really don't understand how this works. Are there any help files and any instructions? It really does meet my need if only I can work out how to make it work! You don't need to use ScriptLab. http://forums.getpaint.net/index.php?/topic/1708-how-to-install-pluginsgeneral-plugin-troubleshooting-thread/ <<< How to install plugins. Correct. Scriptlab is only used to chain effects together. You're running Grid Warp on it's own, so as Welshy said, there is no need to run it through Scriptlab. Don't worry about downloading or installing Grid Warp. The fact that you can find it with Scriptlab means it's already correctly installed. When you apply the Grid Warp effect to the canvas (via the Effects > Tools menu) the changes GridWarp makes are rendered to the canvas when you click OK on the plugin dialog. In addition to what the others have said, ScriptLab only works with plugins you can press ctrl+f to repeat. That means no grid warp, smudge, or random effect. Thank you all. It's amazing to see how simple it is to complicate things! Also fixed a crash that occurs when using Repeat Grid Warp on a larger image. How do you load an image as a background to guide you? Seems to be only colours and clipboard on the popup menu. Run it on a layer with something in it and it will show up in the preview window. Sorry - but a member has reported trouble finding the .dll for Gridwarp on GitHub. I've just looked and can't see it either. I think the .dll is still in Pyro's pack, page one at the top. The source code (for programmers) is hosted on Github, I believe.